Our Whitco 20-litre mixer is a brilliant piece of kit. It’s big enough for almost all needs, it’s easy to handle, and comes at a price that’s hard to beat. What’s more, it’s compatible with the accessories that fit the market-leading machine. We have only a limited availability – so whip one up and whisk it away while you can. The Whitco 20-litre mixer is probably the most versatile mixer on the market. With its 20-litre capacity and three-speed gearbox, it’s large enough to cope with most requirements. However, it is still compact enough to fit into the smallest of spaces. An extra accessory to the mixer is the Whitco stainless steel mobile mixer stand with two lockable castors. This means it can be wheeled in and out of spaces whilst in and out of operation, freeing up valuable workspace. The mixer competes with the internationally recognised market leader of 20 litre mixers, in both looks, durability, quality of manufacture and consistent mixing results, it is also totally compatible with their accessories, yes – they fit the Whitco 20L Mixer! Lastly, the Whitco 20 Litre mixer beats the competitor price, making it a sound commercial decision. And how’s this for a price that’s hard to beat? The package includes the mixer, 20-litre bowl, beater, hook and whisk, stainless stand, 12 months parts and labour warranty, and delivery to the UK mainland for £2,800 + VAT. Finance and leasing are available, details upon request. 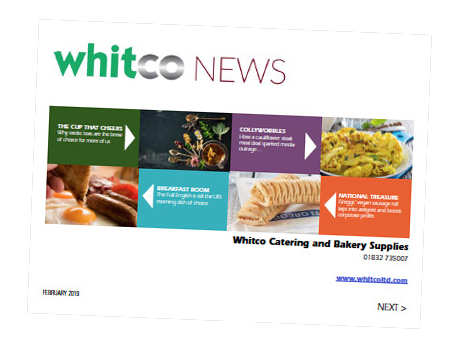 Call Whitco Sales Office : 00 44 1832 735007, email sales@whitcoltd.com, to whip one up and whisk it away!! !